Perfect for festivals, rave party, running - and it makes the BEST GIFT! fits waist sizes from 20" to 51". Strong elastic waist strap will keep your belongings bounce free and ensure that your bag will stay in place perfectly. Samsung Note 8/S8 Plus or any other smartphone devices. The smaller pocket at the front is perfect for concealing your credit card and keys. RFID blocking technology helps to block RFID signals designed to steal your credit card data. for your skin and stays breathable. With our high quality standards for choosing materials, you do not have to worry about breaking the zipper or waist strap. Lifetime warranty. If you are not happy with our fanny pack, return it for a full refund. If you do not love it, we will buy it back from you, no questions asked! We want to help you to live your life to the fullest. It could be spending quality time with family at festivals or running marathons - it's up to you! 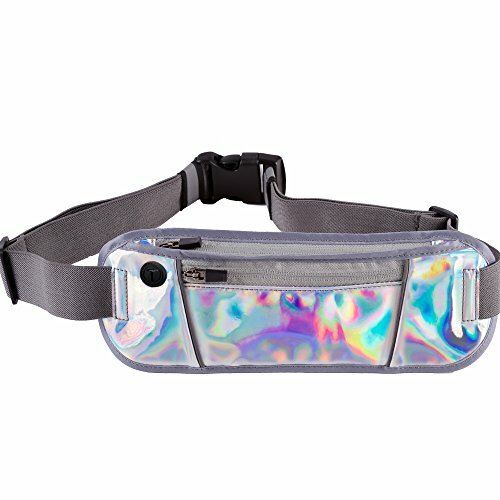 Click "Add to Cart" and order your shiny metallic fanny pack today! UNIQUE DESIGN - Slim design provides comfortable fit while holographic color makes you stand out. CONVENIENT - Take your smartphone, credit card and keys safely with you wherever you go. DURABLE - High quality neoprene material makes it light as well as water and sweat resistant. ADJUSTABLE - Fits perfectly waist sizes from 20" to 51". Plus size or not - It is meant for you! FOR WHO - Do you love festivals? Or you are a fitness person? Fanny packs are meant for everyone! If you have any questions about this product by Vizhora, contact us by completing and submitting the form below. If you are looking for a specif part number, please include it with your message.